Leaving St Kilda cemetery, we headed south down Hotham Street, towards St Kilda East. 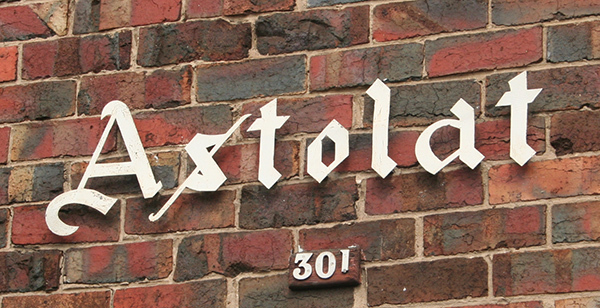 This part of suburban Melbourne – St Kilda East heading into Balaclava – has a lot to offer, when you tune in to it – diverse architecture, appealing old signage, and suburban oddities of various kinds. On the corner of Inkerman and Hotham streets you find Glenfern. This large Gothic revival house was built for Captain John Boyd in 1857, making it one of the older houses you’re likely to find around Melbourne. Boyd was the founder of the family of artists and writers who became prominent in the 20th century (though the family had sold the house by then). The house has loads of gables, chimneys and wood carving which suggests that Captain Boyd, although a military man, appreciated architecture and craft as much as the children who later made his family famous. On a pleasant autumn day Glenfern looks perfectly harmless but you’d hope that on a dark night, with lightning crackling overhead, it takes on a more dismal and sinister aspect, in accordance with its Gothic style. The house went through a number of incarnations during the 20th century – it was a school for a while, was subdivided into flats, and these days is an arts centre with studios for writers. If I ever get a residency there I’ll use it to write a Gothic novel. Next door to Glenfern is a smaller house that reminds me of the marvellous 1930s flats by the maverick architect Howard Lawson in South Yarra (which I wrote about here). I don’t know if Lawson had anything to do with Hotham Hall but features like the barley sugar columns, quaint lettering, and archways leading the eye to intriguing interior spaces are reminiscent of his work. These architectural flourishes are fairly uncommon in St Kilda East though, where much of the domestic architecture consists of cream-brown blocks of 1960s flats, some of which are quite pleasing in a functionalist modernist lego brick kind of way. The street names have a mid-Victorian feel which reflects the time they were laid out. Many are connected with the Crimean War, a pointless conflict of 1853-6 (just before Captain Boyd built Glenfern – was he there, I wonder?) involving Britain and its allies against Russia. Today as it happens the suburb is home to a substantial population of Russian Jewish descent, and you often hear Russian spoken on the street. Many of these migrants arrived in the 20th century, but according to Museum Victoria, Russian Jews were settling in Melbourne as early as the 1880s. Though the Crimean War was mainly notable for incredible incompetence, its key battles, such as Alma, Sebastopol and Balaclava, and commanders such as Lord Cardigan who led the Charge of the Light Brigade, were memorialised in street and suburb names all over the British Empire. On Inkerman St (the name of another battle) we came across a row of little shops with some easy-to-miss traces of deco styling. Right next door is a closed petrol station, with a lovely old bowser still in situ, though the vegetation climbing the pump, and gradually taking over the interior of the building, suggests it has been a while since any petrol was served here. It still seems to be used for storage, but nature is doing its best to reclaim the space. Give that bowser a few more months and it will be engulfed by tendrils. It would make a good installation in a modern art gallery – some statement about fossil fuels and the environment. Near here are the premises of Gronow’s furniture business. Gronow’s name turns up a lot in these parts, in various forms, from different eras, mostly quite faded and missing a few letters, which I like for that reason. Turning off Inkerman and down Nelson Street, we came across a house with a kangaroo on the roof, as you do. Show this picture to your American friends and tell them all Australians live in houses like this. A typical Australian suburban house. On closer inspection it turned out to be Sacred Heart Mission, a charity that works with homeless people. They have done a great job decorating their ‘wishing well’ with an eclectic assortment of angels, gnomes, Barbie dolls, and other ornaments: when the Melbourne Circle Awards are handed out, this will definitely be in the running for the Best Suburban Garden Display gong. Sacred Heart Mission’s wishing well display. Now heading south into Balaclava, we passed this 1925 kindergarten building, designed by architect Best Overend, whose most famous building is perhaps the Cairo flats, which I wrote about here. Entering Carlisle Street, we immediately noticed a few nice ghostsigns, including a couple of well-known suburban names: Sennitts ice cream and Malvern Star bicycles. No doubt the Texas Milk Bar was a popular joint in its day. 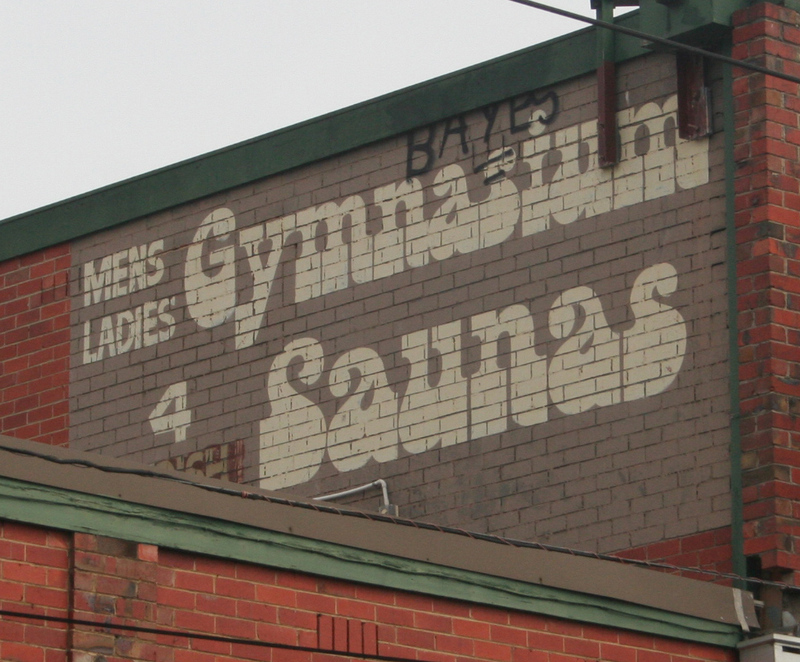 We also spotted some cool typography in diverse styles. Carlisle Street is pretty shabby and run down in parts, but among the shops for lease and the ugly tagging there are still some beautiful buildings. As with many Melbourne suburbs, this part of town offers an almost bewildering range of things to see, each with its own story, when you take the time to tune in to them. This chaotic diversity is part of the charm of such places. The superb art deco former Commonwealth Bank, now remodelled into a cool restaurant/bar. Two-storey Victorian terrace, in good condition, with attractive polychrome brickwork. Hi Nick, I love this project. Thank you. 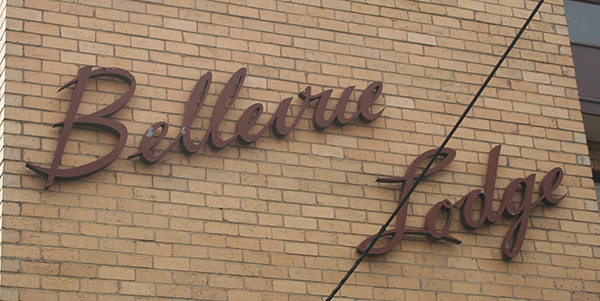 If you are going to write up Balaclava next, check out the Art Deco estate in Lempriere St; the many large heritage houses that have become synagogues, on Alma Rd and Balaclava Rd, the modernist Temple Beth Israel, and the Sidwell Avenue flats, which remind me of the Beverley Hills in South Yarra. Thanks for the tips Yolande! Watch this space. When we lived in Balaclava in the 1990s the Texas Milk Bar was operating as pinball parlour. It was a rather nasty place and there were rumours about what went on upstairs. I contacted the local police and I was told drugs were being sold from there and they were in the process of getting it closed down, which they did. Great photos of an interesting and eclectic area. It’s certainly an intriguing area for a stroll. Love that shot of the retired little petrol station. I always used to wonder about Glenfern when I walked by – for a substantial building of such historical standing it has forever seemed decidedly on the unkempt and neglected side and I’m amazed that the block hasn’t been subdivided as that land would be worth a fortune. Yolande is right about Alma Road, there are quite lovely mansions along the length running from the intersection with Hotham Street up to Nepean Highway. Alma Road was a street the fashionable used to promenade along many years ago & though some beautiful houses have been replaced by flats enough remain to give one a reminder of what this street used to be in a previous life. Your posts certainly remind me of one of the cardinal rules when walking about the inner suburbs on a tour of discovery – always look up – if you keep your eyes on the shop fronts you’ll miss the real story. Thanks Robin, that’s very kind. I’d love to see the booklet. I’ll email you.